The Bison defensive front has caused opponents headaches this season. 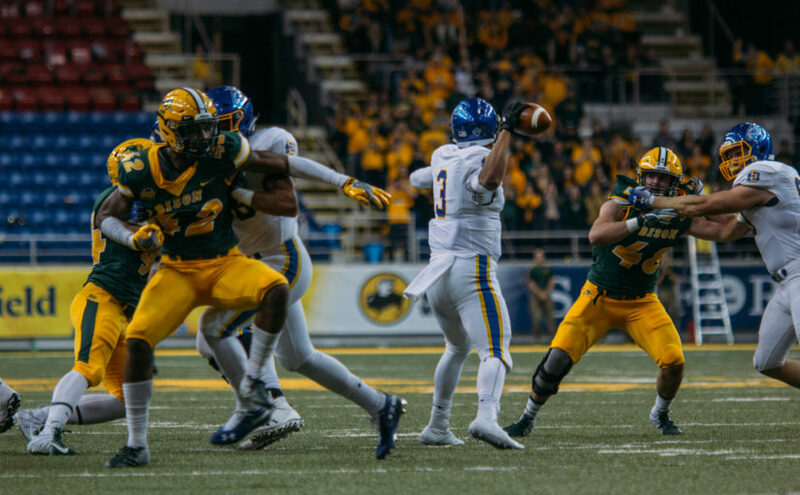 It wasn’t how they drew it up — and it certainly deviated from the usual modus operandi — but at 4:20 p.m. this past Saturday, the game clock struck zero and North Dakota State was victorious again. The outcome on Saturday has been the same as in the previous four games the Bison have played. No matter how the game transpires, there is a commonality in each contest for the now 5-0 Bison. As steady as a metronome, the football is kicked off and three hours later the Bison toast another victory. NDSU has won convincingly, as they did in non-conference play, narrowly, against South Dakota State, and against Northern Iowa, in impressive comeback fashion. Be it mundane, nail-biting or come-from-behind, it has been a mixed bag for the Bison. On every occasion, the Herd has answered the bell. Perched atop the Missouri Valley Football Conference with a 2-0 record in league play, the Bison are in the driver’s seat. While it’s still early, NDSU controls its own destiny. With Illinois State the only top-25 team currently left on the schedule, that destiny is looking more and more like another Valley crown. Conjure whatever cliché you will about the difficulty of Valley play, but the fact of the matter is the Bison are on top of their game and are playing like a runaway freight train. It would be impossible not to favor the Bison in each of their remaining matchups. Even in the potential trap game against the Redbirds, NDSU holds home-field advantage. Only once has ISU won in Fargo. Of course, the aforementioned clichés would not exist if they didn’t hold at least a grain of truth. Time and time again, the team that strives to go 1-0 each week slips up in Valley play. This season though, it has become more and more difficult to envision such a slip-up. One loss, and this becomes nothing more than midseason bluster, but the Bison look downright unstoppable. NDSU can blow opponents out of the water offensively or handcuff any offense with their lockdown defense. They’ve made it clear to the rest of the subdivision that they won’t be beaten. Looking further, it has become apparent midway through the season that this NDSU squad has the chance to be special. For a program that has won six of the past seven FCS championships, the bar for special is high. The ultimate ceiling for immortality in Fargo is the 2013 edition of the Bison. As if beating Kansas State in the first game of the season wasn’t enough, NDSU picked up three top-15 wins in that regular season and walloped Towson in the national title game to top off a 15-0 campaign. The roster that year was littered with program legends such as Brock Jensen, John Crockett, Billy Turner and Marcus Williams. Come the first weekend of January, it’s foreseeable this year’s starters could find themselves in the same stratosphere. Quarterback Easton Stick has done his best impersonation of Jensen this season, all the while chasing his records. With 69 passing touchdowns, the senior is three shy of Jensen. Stick is also well within Jensen’s marks in touchdowns accounted for and yards of total offense. Against the Panthers, Stick captained the offense to 56 points after NDSU fell behind 14-0. The seasoned signal-caller earned Valley offensive player of the week honors for his exploits. Running back Bruce Anderson rumbled for 275 all-purpose yards, as the Bison exploded for 523 yards. The offensive tour de force was proof that their non-conference scoring outbursts were no mirage. The Bison have proven that they can keep pace with any offense or pump the brakes and win with their defense, as they did against the Jacks. Matched up with one of the nation’s top offenses, the Bison limited SDSU to only 17 points. No matter how the game unfolds, NDSU continues to prove it’s capable of winning regardless of the circumstances. This Saturday, Western Illinois looms as the Bison hope to keep the metronome ticking.